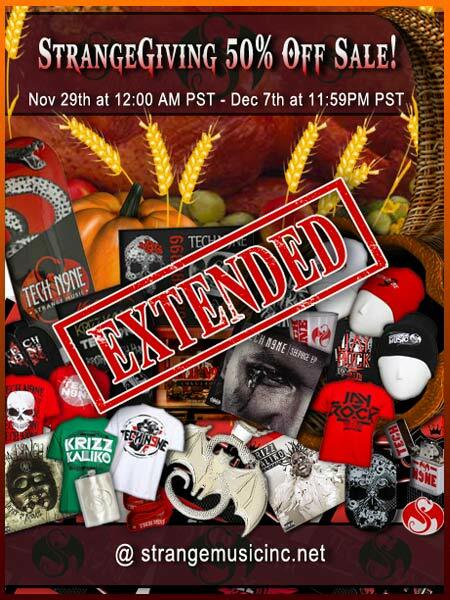 Due to the overwhelming success of the StrangeGiving sale, we’re giving you another chance to stock up on your favorite Strange Music items and we’re not just talking turkey! If you missed it the first time or are just waking up in a mashed potato haze, you have another chance to get everything Strange for 50% off! From now until Tuesday, December 7th at 11:59 PM you can still get all that Strange Music gear you’ve been craving for 50% off! Quantities and sizes are extremely limited, so get to strangemusicinc.net now!